The former National Chairman of the All Progressives Grand Alliance and the current National Chairman and founder of United Progressive Party (UPP), Chekwas Okorie, has disputed claims that the late Biafran warlord, Dim Chukwuemeka Odumegwu Ojukwu, was onr of the founding fathers of APGA. According to him, Ojukwu joined APGA six months after the registration of the party. Chief Okorie in a statement entitled, “I Am the Undisputed Founder of the All Progressives Grand Alliance – APGA” and made available to newsmen, in Abuja yesterday narrated how he founded the party and brought in the former Biafran leader to join the party and become its presidential candidate. He further revealed that it was about six months later that Dim Odumegwu Ojukwu was persuaded to dump the defunct APP for the APGA. He said, “On the 24th of December 2002, he (Ojukwu) agreed to become a member of APGA after I had consented to propose him as our presidential candidate for the 2003 presidential election. “This took place at his No 4 Isiuzo Street residence, in Independence Layout, Enugu, in the presence of Justice Eze Ozobu (rtd), Dr Joe Nwaorgu, Prince Richard Ozobu, Chief H.B.C Ogboko and Chief Onwuka Ukwa. On the 26th of December 2002, I proposed Dim Odumegwu-Ojukwu as our presidential candidate in a well-attended World Press Conference at the Zodiac Hotel, Independence Layout Enugu. 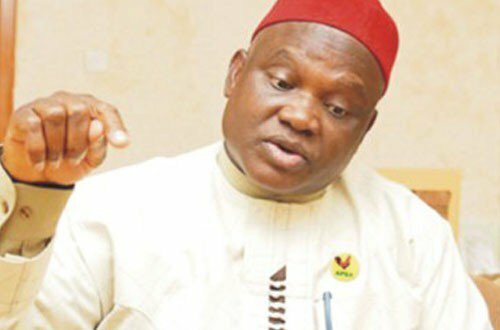 Okorie blamed the distortion of the history of APGA on the former national treasurer and national chairman of the party, Chief Victor Umeh, who he accused of deliberate distortion of facts. He insisted that when APGA was formed Umeh was still a member of the Peoples Democratic Party (PDP). “I am unable to come to terms with the reasons why his wife Ambassador Bianca Odumegwu-Ojukwu, who is aware of the veracity of the above narrative would want to join in denigrating the image of the great leader by dressing her late husband in borrowed robes as if he needed it to compliment his historic and noble accomplishments. This is an obvious and regrettable disservice to the personality of the sage. “The incontrovertible fact is that I, Chief Dr. Chekwas Okorie am the Founder of the All Progressives Grand Alliance, APGA 2002 and the United Progressive Party, UPP 2012. By this feat I proudly join Chief Obafemi Awolowo, Mallam Aminu Kano and Alhaji Waziri Ibrahim, all of blessed memory, as one of four Nigerians who founded two political parties each in their life time”, he added.